What was his favorite brand of Scotch? I can tell you what wasn’t his favorite: Old Smugglers! I never would’ve asked this at Midd since it’s such a cheesy question, but did Neustadt have a president who he thought best exemplified this description, a ne plus ultra of persuaders? Whenever I read you on Neustadt, my mind goes to a wheeler-and-dealer like LBJ. Would he have agreed? Great points, but if I can be unfair and lob a tough question at Matthew let me go with this: where would Neustadt stand when it comes to the functionality of the Madisonian system itself? In other words a number of writers, largely associated with the website Vox, have been arguing (quite effectively) that the whole idea of separate institutions sharing power doesn’t really work. Matt Ygleisas summed this argument up pretty succinctly by saying “American Democracy Is Doomed.” I don’t really agree with them, but we’ve certainly seen our share of political crises in the last seven years. Would Neustadt have a good response for people who want to make the US a parliamentary democracy? Are we all really doomed? No question is too cheesy for this blog! 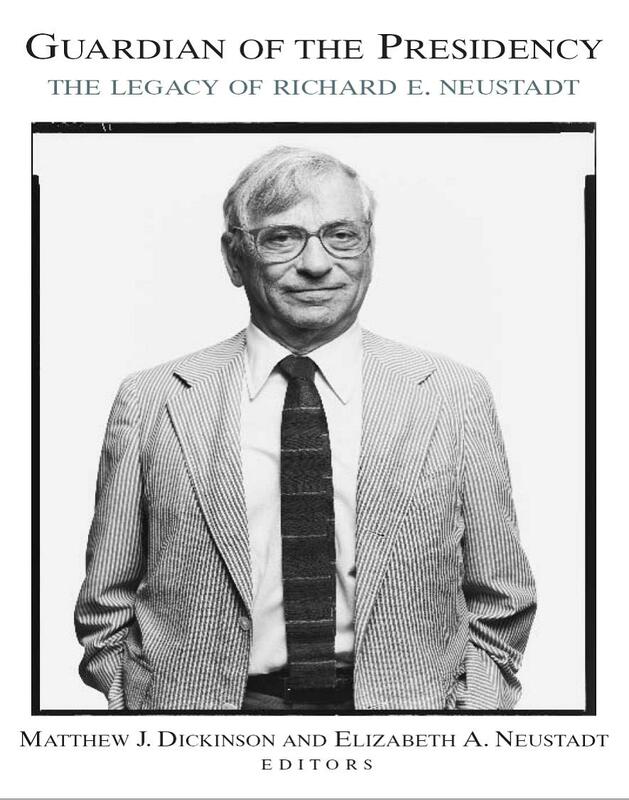 Neustadt did have an exemplar of an effective bargaining president – it was FDR. In his chapter titled Men in Office, Neustadt discusses the specific traits – FDR’s temperament, his experience, his love for power – which he felt made FDR such an effective bargainer. Interestingly, in a subsequent edition to his classic work, Neustadt laments that for all his political experience, LBJ did not guard his power prospects nearly as effectively as Neustadt anticipated. Johnson’s failure caused Neustadt to rethink how best to get his advice across to presidents, something he worked at refining for the rest of his career. An interesting question! I never asked Neustadt this specific question, but we did talk in general about the system of shared powers. I recall that after 9-11 he remarked that it was a good thing that the President could still exercise emergency war powers. I think he meant that in a period of crisis, the normal constraints on presidential power would fall away, at least for the moment, and allow the president to act with the dispatch and urgency necessary to deal with the crisis. So in that sense I think he believed the Madisonian system was still working in that it allowed action when the moment called for it, but otherwise prevented action in the absence of a strong consensus regarding what action to take. But he wasn’t pollyannish about the American system – he recognized that it was an experiment in constant need of nurturing and vigilance.